Today marks the ultimate “this day in history.” It’s Yorktown Day! On October 19, 1781, General Cornwallis surrendered his army to General Washington at Yorktown, Virginia, after a long and debilitating siege. The very first Yorktown Day, however, actually saw Cornwallis absent from the event. On the morning of the 19th Cornwallis signed capitulation documents and sent them back to Washington. That afternoon, when the official surrender ceremony was to take place, Cornwallis failed to show. On the very first Yorktown Day, British General Charles O’Hara surrendered his sword to General Benjamin Lincoln. Time passed however, and Congress failed to make good on their resolution to erect a formal monument at the site. When the Marquis de Lafayette visited the site of the siege on Yorktown Day 1824, it was not a grand marble column that greeted him, but a grouping of wooden obelisks marking locations of redoubts and the scene of the British surrender. Lafayette’s experience of Yorktown Day was a grand jubilee of remembrance, reflection, and pomp and circumstance, and the real monument to American liberty on display that day was Lafayette himself, along with the throng of veterans who turned out to greet him. Original architectural drawing showing the Yorktown Monument nearing completion, with scaffolding still in place. Richard Morris Hunt, 1884. Library of Congress. accepted a design by architects R. M. Hunt and Henry Van Brunt and sculptor J.Q.A. Ward, who endeavored to remain true to the original century old stipulation that the monument be a column, and surrounded it in classical symbolism. 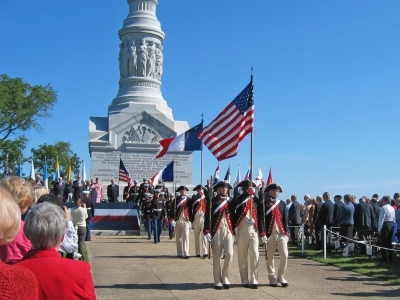 The cornerstone for the monument was laid during Yorktown Day festivities in 1881—the centennial Yorktown Day commemoration. 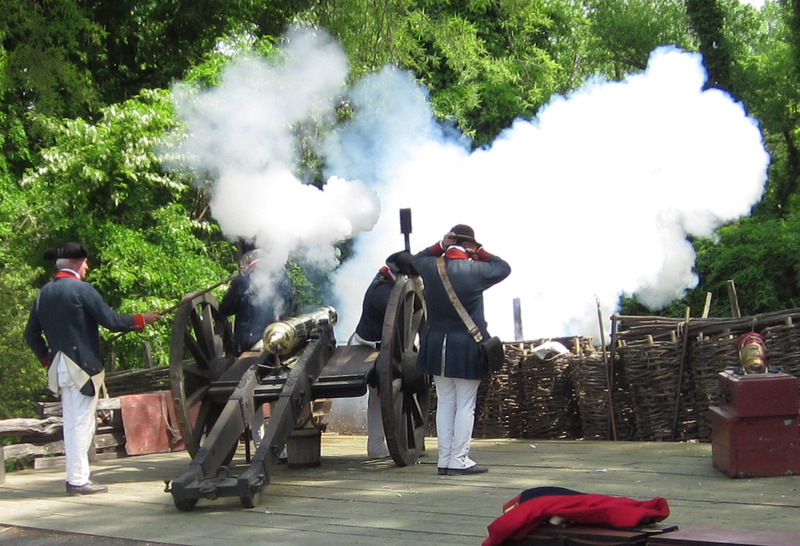 Yorktown Day is as robust and ceremonial today as it was in 1781, 1824, and 1881. The day often includes wreath laying and commemorations, visits from dignitaries and special guests, and a throng of enthusiastic history buffs, veterans, and families from far and wide celebrating “the last and crowning battle” of the American Revolution. How are you celebrating Yorktown Day? As quoted in A Full History of the Monument Erected by the U.S. Government to Commemorate the Close of the Revolutionary War, At Yorktown, October 19th, 1781. Being a Narrative of its Inception, Construction, Completion, and Official Examination (Philadelphia, 1890), pg 15. For more on Lafayette’s visit to Yorktown in October 1824, see Thomas A. Chambers, Memories of War: Visiting Battlegrounds and Bonefields in the Early American Republic (Ithaca, 2012). Congressional Record: Containing the Proceedings and Debates of the Forty-Fourth Congress, First Session; Also Special Session of the Senate, Volume IV (Washington, D.C., 1876), pg. 401.